On Friday, August 7: Dastardly Disco Debutantes & Brazenly Boisterous Boogie-Boys will unite for a thrilling evening of "getting down to the funky sound" as our heroes present the annual ¡Club Queso! extravaganza DISCO LIBRE! 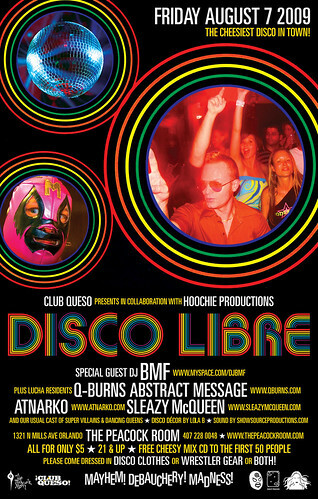 Forged in collaboration with the fabulous Hoochie Productions DISCO LIBRE promises to be a night of obscure disco-influenced fun mixed with a bit of that luchador flavor you've grown to expect from a Queso party. Resident mischief-makers Q-Burns Abstract Message, Atnarko, and Sleazy McQueen will be on hand to provide the groovy tunes along with our very special guest Phat N' Jazzy's DJ BMF. Lola B will making everything look all disco-fabulous while Show Source Productions will be bringing in their boogie-sonic sound system. Let the good times roll. This event takes place on Friday, August 7 at The Peacock Room, located at 1321 N. Mills Avenue in Orlando, right by the corner of Mills and Virginia. There's a $5 cover, it's 21 and up, and the first 50 people get awarded a copy of an exclusive ¡Club Queso! cheesy mix CD. Disco dress, wrestling gear, or both (!) is encouraged. We'll see you at the Peacock Room for DISCO LIBRE!